We have heard that during his life as a householder, pūjyapāda Bhakti Gaurava Vaikhānasa Mahārāja (then known as Śrī Ujjvaleśvara Pāṭa-yoṣī Ratha), being disinterested in worldly affairs, sincerely sought a bona fide guru. One day, as fate would have it, he came across a picture of our mostworshipful Śrīla Prabhupāda. Simply by seeing that picture, his heart was captivated and drawn to the lotus feet of Prabhupāda, who brought auspiciousness to the entire world. At that very moment, within his heart, Śrī Ujjvaleśvara Ratha became eager to meet Śrīla Prabhupāda, and he accepted him as a bona fide guru and best friend who would take sole responsibility for his spiritual life. By Prabhupāda’s causeless mercy, Śrī Ujjvaleśvara Ratha was able to sever his worldly ties with exemplary swiftness and arrive in Śrīdhāma Māyāpura in 1933, where he took shelter of Śrī Śrīla Prabhupāda’s exquisite lotus feet. Seeing his heartfelt attachment to following the path of pure devotion, Prabhupāda gave him kṛṣṇa-nāma mahā-mantra and mantra-dikṣā initiation after only a short while. After receiving dikṣā from our most worshipful Prabhupāda, Śrī Ujjvaleśvara Ratha became known as Śrī Ujjvala-rasānanda dāsa. Noting his disciple’s ever-increasing, intense passion for performing bhajana-sādhana, Śrīla Prabhupāda granted him tridaṇḍa-sannyāsa on the auspicious full moon day of Śrī Śrī Gaura’s appearance, Friday, 1 March 1934, at Yogapītha in Śrīdhāma Māyāpura, the same place where Śrīman Mahāprabhu appeared in this world. 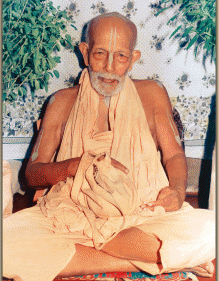 His sannyāsa name became tridaṇḍi-svāmī Śrīmad Bhakti Gaurava Vaikhānasa Mahārāja. From then on, under the auspices of śrī guru, he assumed the role of a roaming mendicant and dedicated his very life to propagating the divine message of Śrī Śrī Guru-Gaurāṅga in various places throughout India, from one region to the next. In his later years, following the disappearance of Śrīla Prabhupāda, at the fervent behest of his Oriya disciples he established Śrī Sārasvata Āśrama in the village of Gauñju-grāma, near Brahmapura, otherwise known as Behrampura. After establishing the service of Śrī Śrī Guru-Gaurāṅga Rādhā-Govinda-jiu there, he remained at that place and performed bhajana-sādhana until concluding his manifest pastimes in this world. Pūjyapāda Mahārāja was naturally resplendent with the multitude ofattributes found in Vaiṣṇavas, but in recalling his simple-hearted, amiable dealings and his sweetly peaceful presence, my heart becomes especially overwhelmed. After the disappearance of our most worshipful Prabhupāda, he bestowed sannyāsa to many of his prominent godbrothers, such as Śrīmad Bhakti-Dayita Mādhava Mahārāja (the founder of Śrī Caitanya Gauḍīya Maṭha), Śrī Bhakti Saudha Āśrama Mahārāja, Śrī Bhakti Śaraṇa Śānta Mahārāja, myself and others. Although he accepted the position ofsannyāsa-guru, he continued to show us the respect due one’s godbrothers, and thereby demonstrated the ideal nature of a Vaiṣṇava, which entails offering respects to others while not expecting any in return. We were stunned to see that even in his extremely advanced age, Śrīla Mahārāja’s acute powers of memory remained unaffected. Every day, we heard him recite songs and prayers from Śrīmad Bhāgavatam, such as Garbha-stuti, Brahmā-stuti, Rāsa-pañcādhyāya, Bhramara-gīta, Prahlāda-carita, and Gajendra-mokṣa. Additionally, he would often recite Brahma-saṁhitā and theentire Bhagavad-gītā, as well as various Vedic mantras and the many hymns composed by Śrī Rūpa and Raghunātha dāsa Gosvāmīs. Although pūjyapāda Mahārāja passed away at a very advanced age, today, in separation from such a highly learned personality—who is actually an ancient devotee of the Lord—we are experiencing acute anguish in our hearts. May he be pleased with us and distribute among us his affection and mercy. 1 The magical and mystical formularies described in the scriptural canonknown as the Tantras. 2 The ghost of abrāhmaṇawho has died prematurely after hisupanayana-saṁskāra (sacred thread ceremony). 3 Eating only once the day before Ekādaśī, fasting from everything includingwater on the day of Ekādaśī, performing hari-saṅkīrtana through the night, and eating only once the following day. 4 Karṇa, a personality mentioned inMahābhārata, is known for charity andselflessness.